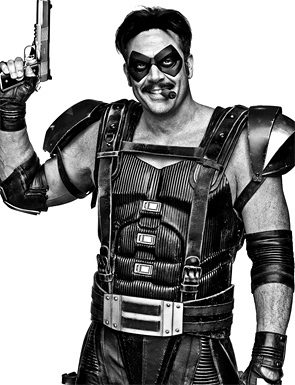 To fuel the hype for Watchmen even more, Empire has debuted a beautiful set of black and white character portraits. Being that there is no other movie on my mind that I am more excited for right now, I can't help but share these. The photos were shot by world renowned photographer Clay Enos and are part of an impressive coffee table book called Watchmen: Portraits (pre-order it on Amazon) that features candid black and white shots like this of everyone from the cast to the crew and so on. Even if you've seen everything from Watchmen and are starting to regulate your intake, these are still worth checking out. Click any of the photos above to see larger versions of each or you can head over to Empire to see Billy Crudup as Dr. Manhattan and Matthew Goode as Ozymandias. Don't forget to pre-order the book! There are onley two movies i must see this year! The watchmen and avatar!!! Movie Fan - nice find! Kovacs, Dr Long and Seymour are made of epic win. Looking at these pictures just made me realize how NOT in-shape Jeffery Dean Morgan is. Not that I should point fingers. I guess I've just been spoiled by actors like Christian Bale and Robert Downey Jr. - guys who put in the effort to look the part physically and not let the costume do all the work. Uhh...look at the pic of Rorschach. What kind of gun is that? This whole viral marketing thing has gone overboard. The more I see, the more concerned I become that Snyder is going to butcher Moore's masterpiece. to #5, if you read the graphic novel, you will find that 'The Comedian' is not in shape. 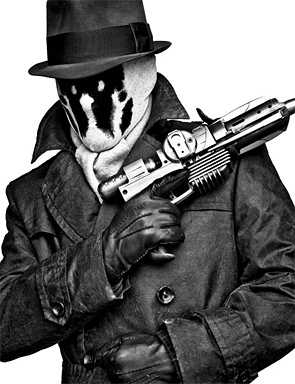 to #6, the gun Rorschach is holding is the grappling gun that, in the book, Nite Owl makes for him and is his "weapon of choice"
So far I'm loving what Snyder has done to the source. I know it has been hinted at that the ending will be different but I lose more and more fear with every sneak peek we get. This is my most anticipated movie now that I have seen Che and will see The Wrester. IMAX here I come! I've read the graphic novel and I remember him being at least a little muscular. 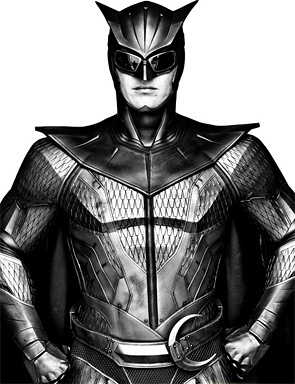 Maybe not so much in his later years (similarly, Nite Owl had a ponch, but where is it in the movie?) but enough that he looked imposing. Yeah wheres the theater hopper? Thanks Dave, #6 here again. Yes, I know what it's supposed to be but it just doesn't fit in to me. I always pictured it being much smaller. That's the point I was trying to make. I hope they're not trying to substitute style over substance in this film. One thing about this movie is that at least some of the the heroes look like comic book heroes, that is, with pretty wild looking costumes. Comic book heroes should have costumes. Otherwise, they may as well just dress in warm-up--maybe armored-- suits or Giorgio Armani or Urban Gear or whatever. Something I dislike is the trend among movie makers--and some comic fans (like Wizard Magazine)--to say "Oh, they can't have the costumes. It's not "realistic."" As if the actions of people like Batman or Captain America are "realistic" anyway. If those fans don't like costumes, why have they for decades been buying comic books full of the exploits of costumed characters? Some of these costumes have been around for 50, 60, 70 years, have sold millions of comic books, toys, games, etc., and are as recognizable as the characters' names. They are, to use a much-overused and abused term, the "brand." For the under-appreciated Flash TV show in the 90's, the first thing the network suits wanted was to put him in a running suit (seriously!). Paul Dini said, "OK, then I'm walkin'." Yay Paul! The costume is a major part of what makes a comic book hero just that. Let your Freak Flags fly, heroes! Those are awesome, and the Silk Spectre is looking great.